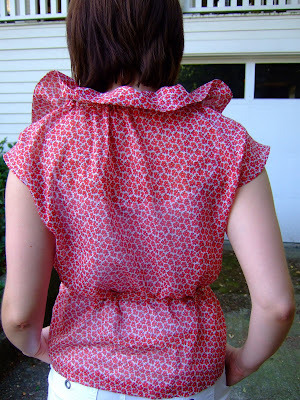 Today I completed my wearable muslin of blouse 113 in the July 2007 BWOF. Overall I'm pretty satisfied and I'm planning to make it again. 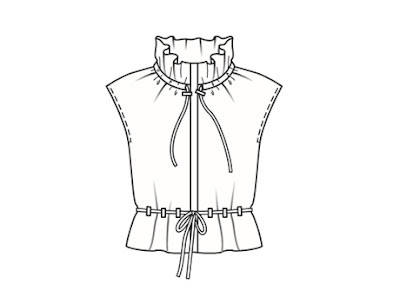 The collar can be more or less ruffly depending on how long or short you keep the drawstring with the cordstops. I deviated from the pattern by making only 4 belt loops instead of the suggested 12, I raised the placement of the belt loops, and I made the belt a bit wider. When I make this again, I'll add about 2 inches to the length. That is too cute! If you pull the collar down does it stay down pretty well? You have the best eye for picking out fashion forward items. I love it. That's really cute. It caught my eye in WOF too. I probably wont' get to it though! What will you make it in next? loopylulu - Yes, the collar will lay down pretty well if you pull the cord stops out farther; in fact I'd wear it this way if I wore the blouse to work probably. It looks cute on you! Very cute! I liked that in the magazine when I saw it and it's fun to see it made up for real. Awesome blouse! I really like the collar! Beautiful! Very cute top! I love the style of that. Lovely! I wondered how that blouse would look in "Real Life," and now I'll probably have to give it a go. Thanks for posting about it. That is adorable! I love it!! 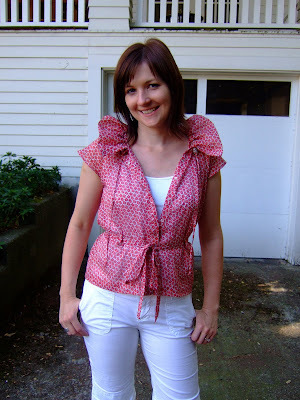 I've never made a Burda pattern, and this makes me want to try one!! What a great yard sale find. That pattern and that fabric are perfect together. The blouse looks so light and airy. It is nice that the collar can be worn up or down. It gives you a lot of variety in looks. Looks so great! I have only made one Burda pattern and it was not proportioned for my body shape at all, but this is so sweet I will give them another try! I love the shirt, Christina! It looks really cute on you. I'm wondering what it looks like with the collar at the neck and tied. Have you tried it and do you like it that way? I love the pattern and might try it myself!